Disclaimer : This article to calculate taxable returns on impact of Sec 194DA is for general informational purposes only. It is not a substitute for professional tax-related or investment-related advice. We recommend you consult a tax professional before you act on this or related matters. This is in continuation with the previous article on how introduction of Sec 194DA has enforced insurance companies to cut TDS on Life Insurance policies which are not compliant with Sec 10(10(d)) and whose income exceeds 1 lakh in a financial year. If you haven’t read that article yet, we strongly suggest you do that before you read this one. This article will specifically focus on how to calculate taxable returns based on the impact of this new Section 194DA. Firstly, let’s be honest here. When you had originally invested into a plan whose Sum Assured is less than 10 times of the annual payable premium, clearly with the motive of getting returns and not from the primary point of view of getting life insurance cover. So you shouldn’t be surprised if now, after this new Section 194DA has been introduced, your ‘investment’ in insurance is getting taxed. Your life insurance policy may have suddenly become a leaking bucket. But you should not worry because you will not be worse off than your normal tax liability. 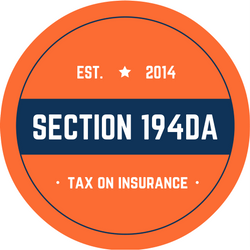 Most of the cases affected by Sec 194DA are Single Premium policies which do not meet the 1:10 criterion. Most traditional Single Premium policies almost always yield profits, i.e. net positive returns. However, ULIP Single Premium policies being market-linked may yield negative returns as well. That is, what you get as final returns may be less than the total premium you paid. This case is fairly straightforward. All you need to do is calculate the profits and add it to your income in the year of receiving proceeds from the life insurance policy. Here is an example to illustrate how the tax calculation works. Remember to also claim the TDS benefit, so you need to pay tax after adjusting the TDS already deducted by the insurance company before they paid you the maturity proceeds. This is where there is some ambiguity amongst many of our readers. In such a case, we refer to Circular No. 7/2003 dated 05-Sep-2003, Finance Act 2003 from the Income Tax department. As per that, tax should be paid on income accrued on life insurance policies which does NOT include premium paid by the assessee. Here’s the extract from the said circular. 10.3 The insurance policies with high premium and minimum risk covers are similar to deposits or bonds. To ensure that such insurance policies are treated at par with other investment schemes, amendments have been made in section 88 and clause (10D) of section 10. The existing clause (10D) of section 10 has been substituted so as to provide that the exemption available under the said clause shall not be allowed on any sum received under an insurance policy issued on or after the 1st day of April, 2003, in respect of which the premium payable in any of the years during the term of the policy, exceeds twenty per cent of the actual capital sum assured. In view of this, the income accruing on such policies (not including the premium paid by the assessee) shall become taxable. However, any sum received under such policy on the death of a person shall continue to remain exempt. The new provision also provides that the amounts received under sub-section (3) of section 80DD, shall not be exempt under this clause. Therefore, when you calculate taxable returns if there is a loss from investment into the insurance policy, i.e. what you get as return (before TDS deduction) is less than what you paid as premium (including top-up), then no tax is payable by the assessee. This is pretty logical as well since premium you invested is anyway taxed earlier. It is also in sync with the treatment for most other investment products. It is surprising though that insurers are still deducting TDS on such cases. 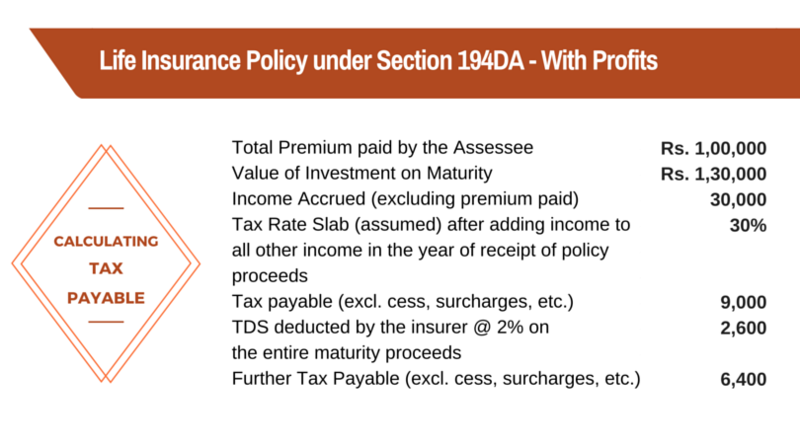 Shown above is the calculation of taxable returns from Life Insurance in case of loss from investment into a life insurance policy falling under Sec 194DA. Please note the following for both the calculations above. Tax rate slab is assumed at 30%. You may make changes as per your actual tax rate. TDS and Tax payable shown here are only the basic taxes, i.e. they do not include any cess or surcharge. Please add/deduct them from payable amount/TDS respectively. Effective June 1, 2016 the effective TDS rate has been reduced from 2% to 1%. Please use the rate that is applicable for your policy. 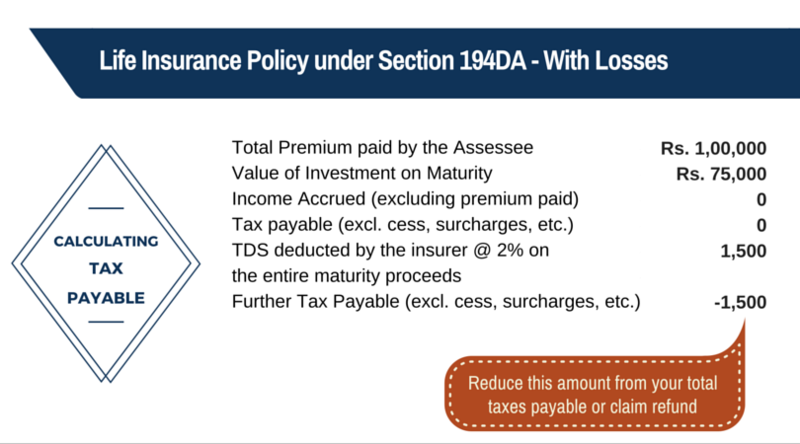 We hope this helps you get clarity on how to Calculate Taxable Returns for life insurance policies under Sec 194DA. Do share your views in the discussion thread below. And while it is great that you are thinking of your investments, make sure that you protect your savings and assets with a term insurance plan. *We are grateful for the inputs provided by Mr. P Singh on this topic.